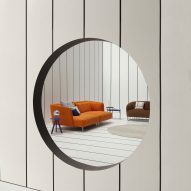 Dezeen promotion: Japanese kimono dresses informed the design of this bed-like sofa by Spanish brand Sancal, which features quilted fabric covers ideal for afternoon napping. The Obi sofa is named after the sash that cinches kimono dresses in at the wearer's waist. 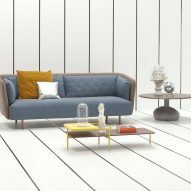 Sancal designer Rafa García based the sofa design on this, aiming to create a seat that embraced its user. Set low to the ground, the chair features a broad seat that is hugged by its backrest. "I like to find inspiration in photography and found some pictures of Japanese women dressed in kimonos – clothes that seem to hug you," said García. "I wanted to design a sofa in this style, where you could feel comfortable, embraced." With Spanish siestas in mind, García wanted the chair to be comfortable enough for napping and chose a thick, quilted fabric to cover it. The quilting technique can be applied to a variety of materials, making the sofas versatile for different interiors. "The sofa is quilted because when you take a fabric and quilt it the characteristics of the same fabric change a lot, you make it richer, give it greater body and presence," said the designer. 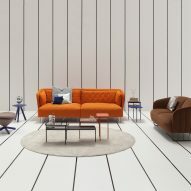 The feet of the sofa are available in two versions – wood, as a nod to the traditional clogs worn with a kimono, and a more contemporary acrylic. The modules making up the sofa can also be configured to fit into a range of domestic settings. 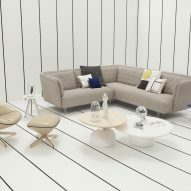 The Obi sofa is part of the brand's 2016 collection, launched earlier this year at Milan design week. 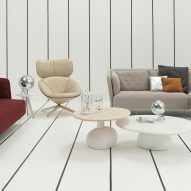 It also includes a larger version of the Tonella lounge chair by Note Design Studio. V&A's acquisition of Dali Lips sofa an "absolute triumph"